- Having a working dedicated (ie other players can connect). Using some nat-router modems, ports redirections don't work for connections from local network, or at least when the connexion come from the computer there are redirected to. If you have a router which refuse such redirection, you just can't connect to your TM dedicated server in internet mode (so, no ladder ). Thanks to Mistral for the idea, and you can find some additional info here too. 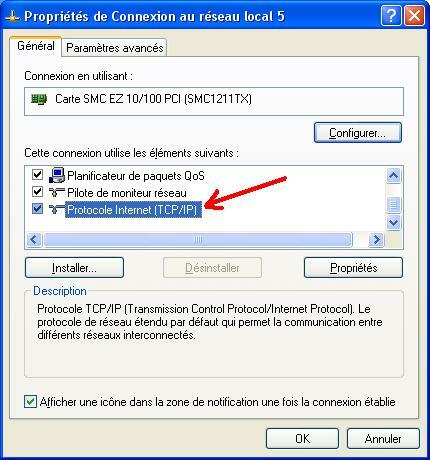 You will have to add the public IP of your internet connection to the network adapter of the computer on which you start the dedicated. If the game and the dedicated are not on the same computer, you will have something else to do, see below. 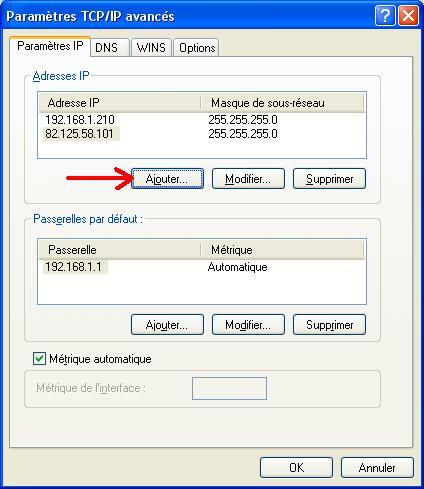 In the example, the public IP is 82.125.58.101, and the local IP of the server is 192.168.1.210. Of course you will have to replace them by yours IPs ! To find your public IP, you can for example go there. For other linux, look for ip config and aliases in the documentation. 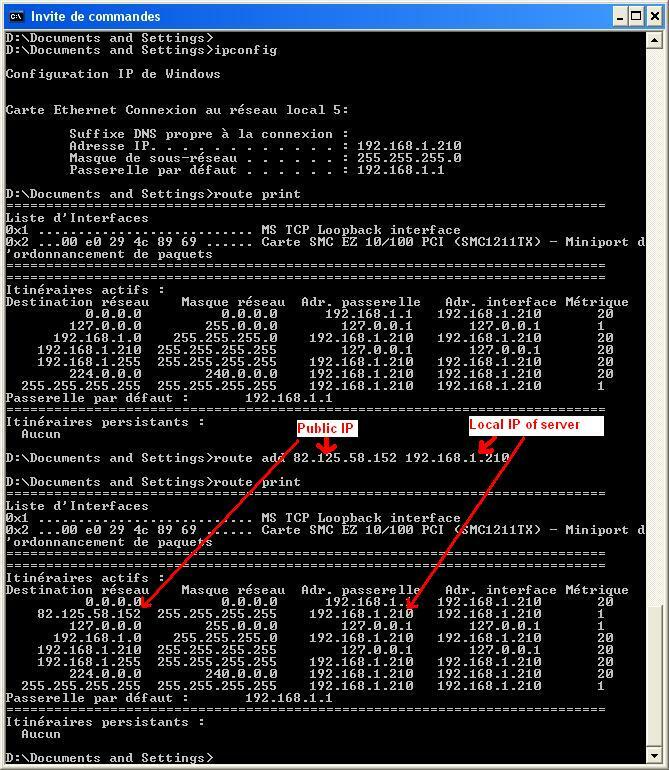 - add a second IP to the client too, in the same LAN IP than the one you added for the server (with previous example, i could have used 82.125.58.102). Same method than before to add the IP. Here it is "Local Area Connection"
This will ADD the WAN address of your router to your local interface. 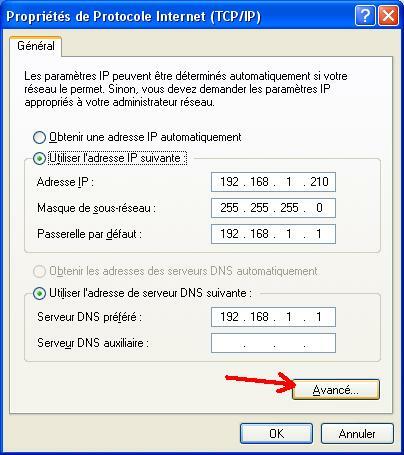 This means when ever you try to connect to the OUTSIDE address of your router (you normaly dont do this - but you have to for trackmania, because thats the address of your server stored in the masterserver's database) the request will goto the local interface. When you are done or your DSL router gets a new address, you should delete the entry and redo above with new address. Then i did that command line write my WANIP a table wiht adress conflict shows up;// Why? My static ip is 10.0.x.x and WANIP 84.32.x.x. Even your doublepost wont help us to find your mistake. Ezlock wrote: Then i did that command line write my WANIP a table wiht adress conflict shows up;// Why? My static ip is 10.0.x.x and WANIP 84.32.x.x. Did you try a 'ipconfig /all' to verify your actual config ? are you sure your actual interface ip is static (ie not in automatic dhcp mode) ? Yes i try ipconfig by tutorial, my ip is internal and DHCP is disabled;/ So what to do now? Ezlock wrote: Yes i try ipconfig by tutorial, my ip is internal and DHCP is disabled;/ So what to do now? Don't know, it should not happen if you are sure that not other computer in your LAN has that ip, and that no other interface of your computer has that ip. Perhaps that strangely some modem-router set their public ip on their LAN interface ? if really it's the case then i see no solution. nothing... i've done everything but my pc said that there is a IP conflict... and i can't join ladder... anyone? totemx wrote: nothing... i've done everything but my pc said that there is a IP conflict... and i can't join ladder... anyone? You are not the first i see having an IP conflit. It's really strange, there is no logical reason. Are you sure you configured correctly your main ip statically (and verified that your connection still work ok), then add on your computer network interface a secondary ip (the public ip of your router). If it was done correctly, an IP conflit would mean that your router have also its public ip on its lan interface, which is really really strange. What is your router, what is your computer OS ? *push* - gosh why this isnt sticky? Nice guide, but i presume this is for routers without NAT? Started server and ignored warning. Told my mates to connect, and it worked. Then i sat behind my gaming rig and joined through both LAN connection and through the gamebrowser itself..
No need for putting your WAN IP in your nic's. If you dont have a NAT enabled router then just join through LAN, because the server is broadcasting both WAN and LAN. No problems if you join LAN side and others WAN side. Katana wrote: No problems if you join LAN side and others WAN side. You can't score ladder points through LAN.